As one of the councillors who voted in principle to bid for and accept the money from government to put new lighting in St Martin’s Square and the Town Centre, I am shocked and embarrassed by what the administration have done. Who on earth thought that serried ranks of purple poles, with the off-cuts of Robbie the Robot perched on top, could possibly improve the look of the area or the quality of the public space? And in an age when we worry about light pollution and climate change, why do they cast light up but not down? And why are they on in the day? 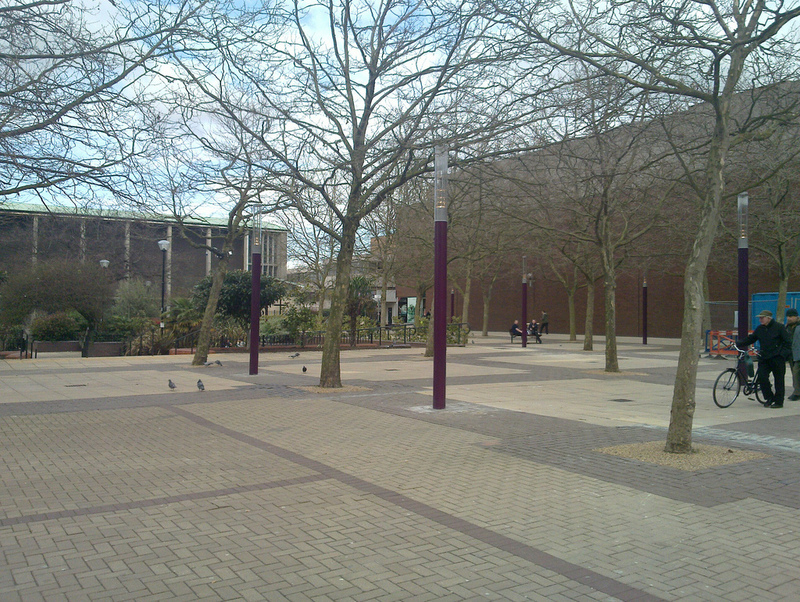 How ironic that at last week’s Cabinet we considered a report on Basildon’s open spaces which rated St Martin’s Square very highly – before the bulldozers moved in. It is very sad that the Tories placed petty local politics above even their own administration’s assessment of the value of this civic space. A friend at dinner joked that maybe they were landing lights for the aliens coming to collect their purple squid tentacle lights… If only. It just goes to show that even when one votes for something which on the surface appears to be a good idea our local Tories have the capacity to screw up. Clearly they have suffered a “coomonsense” bypass and demonstrated once again an inate ability to ruin our public spaces (and art). Walking through the town the other day made me feel like an extra in the film Equilibrium set in a dystopian near future where all things beautiful which could spark human emotion are banned and everyone lives an existence of Stasi (E.German secret police) like constraint and watchfulness: those awful cameras! A small group of people risk their lives to hide and cherish objects of beauty and past artifacts such as poetry books and musical instruments. Basildon Town Centre is cluttered and disjointed. Maybe this will eventually be sorted but right now I have little faith. Sorry for the typos – bit early in the morning for me!